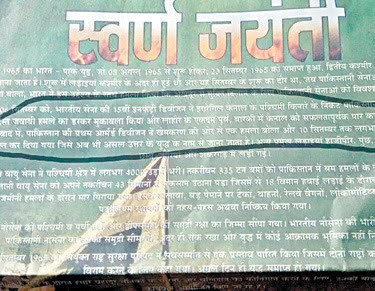 A full-page Indian Army advertisement published in major Hindi national dailies recently says that the Indian forces responded to the Pakistan attack with fear (darkar muqabala kiya). It was later clarified as a typographical error which changed "datkar muqabla kiya" to "darkar muqabla kiya". Let's examine whether the typo was in fact a Freudian slip: An unintentional error that revealed the real truth. The best source to examine it is "1965 War: The Inside Story", an authoritative book on 1965 war written by RD Pradhan who was personal assistant to Indian Defense Minister Y.B. Chavan in 1965. Mr. Pradhan has based his book on Mr. Chavan's diaries kept during the war. Mr. Pradhan has devoted an entire chapter of his book to how General Jayanto Nath Chaudhuri, the Indian Army Chief, badly panicked when Pakistani forces mounted a fierce counter-attack during 1965 war. At one point, Gen Chaudhuri ordered Gen Harbakhash Singh to pull back behind the Beas, essentially leaving much of Indian Punjab to Pakistan. Alas, the core issue of Kashmir still remains unresolved 48 years since Mr. Chavan wrote his words of wisdom. And, unfortunately, India's Hindu Nationalist Prime Minister Narendra Modi refuses to even talk about the Kashmir issue, much less resolve it. Riaz Bhai: The purpose of any war is to obtain political or strategic objective. Pls elaborate in which war Pak achieved anything. Christine Fair mentions in her book "Pak army has never won any war". We all know what happened in 1971 and 1999 Kargil war. In the former you lost half of the nation in 16 days and in the latter you lost all the peaks you captured during the winter of 1998-99 (by fraudulent means when both armies vacate LOC in winter). And it is so disappointing that while living in the US you talk about war and destruction. You are bordering on being flippant because you want both countries to be destroyed (as long as India is destroyed too). Could it be that Pakistanis know they can't ever compete with India on economy, so destruction is the only topic worth talking about. RK: "Pak army has never won any war". So where did "PoK" come from? All of 711 glaciers of the Karakoram and border with China that is making CPEC possible? And Muzaffarabad and Giligit-Baltistan? All these just fell in Pakistan's lap from the sky? And how has Pakistan been able to keep "PoK", a territory claimed by India? And how has Pakistan, a country described by Mountabatten and Nehru as a temporary tent back in 1947, been able to defy a 7X larger hostile neighbor? And why is India unable to act on its "Israel envy", a term coined by India's own Sashi Tharoor? RK: "And it is so disappointing that while living in the US you talk about war and destruction. " No one talks more of war more than India's Hindu Nationalists and other Indians who have never reconciled with the idea of Pakistan. Fifty years after the 1965 Indo-Pak war, deputy leader of Congress in the Lok Sabha, Captain Amarinder Singh, has shed new light on an order allegedly given by the then Army Chief to withdraw Indian Army troops in Punjab, which could have led to the surrender of Amritsar. Speaking to The Indian Express, Amarinder revealed he is writing a book on the 1965 war to mark its 50th anniversary. The book will trace battles fought in various theatres during the war, and give detailed information about several contentious issues. One of these is an order allegedly given by then Chief of Army Staff Gen J N Chaudhari to the then General Officer Commanding-in-Chief of Western Command, Lt Gen Harbaksh Singh, to withdraw Indian troops in Punjab. The order, had it been carried out, would have meant the surrender of Amritsar to the Pakistan Army, besides causing panic among Indian troops. 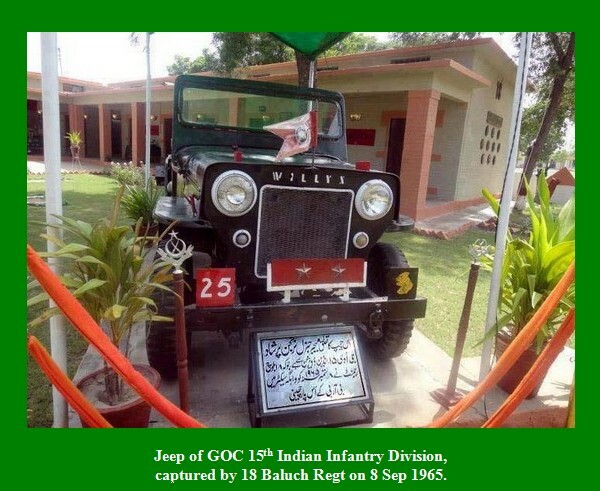 In September 1965, the Pakistan Army surprised Indian defenders in the Khemkaran Sector in Punjab when their armoured division made a dash towards the town of Khemkaran and captured it. The Indian Army had to pull back towards the village of Asal Uttar to consolidate their defence. The Pakistani division was believed to be in a three-pronged attack in which one column was heading towards south of Amritsar, one towards the town of Jandiala and another towards Beas. After the initial surprise, the Indian Army reinforced its presence in the area and the Pakistani advance was defeated in the Battle of Asal Uttar. The village is now known as the graveyard of Patton tanks. Amarinder, who was the aide-de-camp of the GOC-in-C during the war, said he was a witness to the fact that Lt Gen Harbaksh received a call from Gen Chaudhuri late at night while the Pakistani armoured offensive in Khemkaran was under way. Gen Chaudhuri wanted the Indian troops to withdraw to river Beas, which would serve as a natural barrier to stop the advance of Pakistan’s armoured division. “We had returned from Khemkaran very late and the general had gone to sleep when I received the call from the chief and put it through to the army commander. The general was heard telling the chief that he would not carry out those orders, and if he wanted this to be done, he should put it down in writing,” said Amarinder. According to the former Punjab CM, the army chief went to Ambala the next day and met the GOC-in-C but did not mention his order of the previous night, because by then the battle in Asal Uttar had stabilised and the situation was under control. “Had it been anyone other than Lt Gen Harbaksh, he would not have been able to resist the orders of the army chief. And had those orders been carried out, we would have had to surrender Amritsar, and the road from Beas onwards to Delhi would have been open because there would have been general panic. It would have been a repeat of 1962,” said Amarinder. Indian journalist Shivam Vij on 1965 War: "India's own official history of the war, published only two years ago, is scathing in its review of how poorly the Indian army and air force performed. The Indian armed forces are now rewriting the history to show that it was a clear victory....On the outskirts of Srinagar, to make sure that no Pakistani fighters were hiding in an area, an entire colony was set on fire by Indian forces. I have been to that place, and people remember that even today, blaming India for being insensitive. The war showed it was not going to be easy for Pakistan to liberate Kashmir militarily, and though the Kashmiris didn't rise up with the Pakistani fighters, it exacerbated a conflict between India's security forces and the locals in Kashmir." 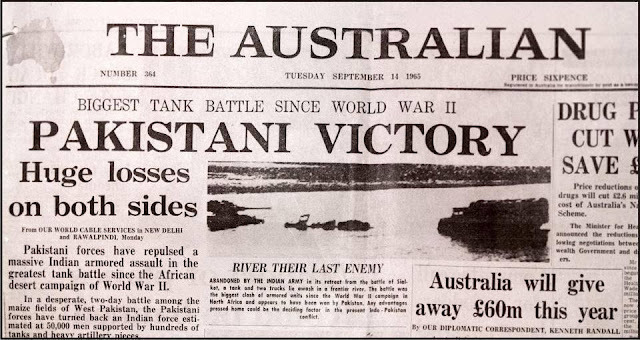 Manoj Joshi Op Ed published in India on 1965 war. This is what the commander of the main effort, Lt Gen Harbakhsh had to say about the main thrust to Lahore that faltered on day one itself, largely due to incompetent leadership of the division and its brigades. On September 6, XI Corps launched a surprise attack at 4am, led to the crossing of the Ichhogil canal and the capture of the Bata shoe factory on the outskirts of Lahore by 11am. But the senior commanders could not cope with the situation and ordered a withdrawal to the east bank of the canal by that evening. Despite capturing some 140sq mi of land, and crippling Pakistan's 1st armoured division at Khem Karan, XI Corps performance, Singh says it was "a sickening repetition of command failures leading the sacrifice of a series of cheap victories." The performance of India's premier I Corps, built around the 1st armoured division, was no less disappointing. I Corps captured 200sq mi of territory and destroyed a great deal of Pakistani armour. But it did not deliver what it was meant to - a decisive battlefield victory. "With the exception of a few minor successes… The operational performance was virtually a catalogue of lost victories." Singh praised the performance of units like the Poona Horse, but was harsh in his judgement of the higher commanders. Harbakhsh's third corps - the XV Corps, which then, as now, looks after Kashmir, fared better. It gained an unambiguous victory in capturing the Haji Pir Pass and in defeating Operation Gibraltar. However, it was battered by the surprise attack launched by Pakistan in the Chamb sector on September 1. India also launched an offensive in the Rajasthan sector with a view of tying down Pakistani forces in Sind. But the plan was poorly conceived and executed. There was no joint planning, leave alone coordination, between the Air Force and the Army. This led to the Lahore fiasco when Pakistani air strikes disrupted the Indian offensive on September 6. Despite seeing action on September 1 in Chamb, the IAF was unprepared for the strike on September 6 when the Pakistan air force (PAF) destroyed 13 aircrafts in a raid on Pathankot, including two new MiG-21s. Similar raids found the IAF station Kalaikunda in the east unawares leading to the destruction of eight aircraft on the ground. Intelligence was equally shoddy. India failed to pick up the fact that the Pakistanis had surreptitiously raised an additional armoured division and the IAF could not locate the PAF aircraft in East Pakistan. There are of course, bigger questions. Indian accounts claim that there was no plan to capture Lahore. If not, then why were three divisions thrown at it? And if the plan was to just carry out shallow attrition attacks, it nearly came a cropper in Khem Karan when Pakistan launched its 1st armoured division in a bid to reach the Beas bridge that would have cut off Amritsar. Fortunately, they were trapped at Asal Uttar and defeated. PAF was a superior force (technology, ASM, Air Defense) but was initially kept out of the war by your PA to ensure all credit remained with them. Idiots - if they had done a joint co-ordinated action, India would have suffered tremendous losses and perhaps Pakistan could have achieved some of its strategic objective. There are plenty of stories on PA blunders (including pausing the Akhnoor charge to change the commander) but listing blunders or cowardice in War is just downright petty and crass. Atleast those men (on both sides) had the courage to be on the front, unlike you and I. Former US President John F Kennedy had played a “decisive role” in “forestalling a Pakistani attack” on India during the 1962 Sino-India war, even as Pakistan was capable of taking advantage of the situation to take control of Indian-occupied Kashmir, Bruce Riedel, a former CIA official, has revealed in his book. “Pakistan was clearly capable of initiating war with India, but decided in 1962 not to take advantage of India’s vulnerability,” Riedel wrote in his book titled JFK’s Forgotten Crisis: Tibet, the CIA and the Sino-Indian War. The book also revealed that on October 28, 1962, the day before former Indian prime minister Jawaharlal Nehru asked for American military help, then US ambassador to Pakistan Walter McConaughy met with the then Pakistani ruler Ayub Khan. “The Ambassador urged him to send assurances to Nehru that Pakistan would not take advantage of India’s war with China,” Riedel wrote. In response to that, Khan suggested that “the Americans and Pakistanis work together to seek the surrender of Indian territory just as the Chinese were grabbing land”. However, the US considered this as ‘blackmail’. Riedel also wrote that the then US ambassador to India J K Galbraith sent an ‘alarming telegram’ to Washington and Karachi, asking, “for God’s sake that they keep Kashmir out” of any American message to Pakistan. US immediately sided with Galbraith on Kashmir and advised Nehru to write a letter to Ayub Khan. “Kennedy’s message to Ayub Khan, reinforced by a similar message from [then British] prime minister [Harold] Macmillan, left little in doubt that the US and the UK would view a Pakistani move against India as a hostile and aggressive action inconsistent with the SEATO and CENTO Treaties,” he wrote. “The Americans told Pakistan that the Chinese attack was the most dangerous move made by Mao since 1950 and that they intended to respond decisively,” he added. The book also disclosed that as India began to lose territory to China, Nehru asked for US help in the war and wrote to Kennedy asking him to provide jet fighters to defeat the Chinese. “A lot more effort, both from us and from our friends will be required,” Nehru wrote in his letter. In a state of panic, Nehru wrote another letter to Kennedy which was hand-delivered by the then Indian ambassador to the US on November 19. “Nehru was thus asking Kennedy to join the war against China by partnering in an air war to defeat the PLA (Peoples Liberation Army of China). It was a momentous request that the Indian Prime Minister was making. Just a decade after American forces had reached a ceasefire with the Chinese Community Forces in Korea, India was asking JFK to join a new war against Community China,” Riedel wrote. According to Riedel, Nehru asked for 12 squadrons of US air forces, as well as, “two squadrons of B-47 Bombers” to strike in Tibet. “A minimum of 12 squadrons of supersonic all-weather fighters are essential. We have no modern radar cover in the country. The United States Air Force personnel will have to man these fighters and radar installations while our personnel are being trained,” Nehru wrote in the letter. Nehru had also written to Britain for help. However, China soon announced unilateral ceasefire, fearing that both Britain and the United States were preparing to help India win the war. Riedel admits that although we will never know what the specifics of American assistance to India would have been if the war had continued, “We can be reasonably certain that America, India and probably Great Britain would have been at war together with China”. What was the point of attacking an inferior country like India in the first place? India took kashmir via legal channel and the political leader of Kashmir Seikh Abdullah was ok with it. but after 18 years of independence attacking a peace loving democratic country like India under the whim of a military dictator Ayub Khan was brutal enough in the first place. In such a position India defended itself from further aggression which is more than okay. Shuvodeep: "India took kashmir via legal channel and the political leader of Kashmir Seikh Abdullah was ok with it." So why did India go back on its commitments of plebiscite to the Kashmiris and the international community?